She’s the queen of crime. The best selling author of all time. As it so happens, a great consumer of cream (yes, just plain clotted cream out of the jar). And it’s her 125th anniversary this year. Of course I am referring to the late, the great, the impossible to emulate Agatha Christie. Agatha Mary Clarissa Miller was born on September 15, 1890 in Devon, England into a middle class family. She was home schooled largely by her American father, and taught herself to read by the age of five. Like the Bronte sisters, Agatha invented imaginary friends, played with her animals, attended dance classes and began writing poems when she was still a child. Her father died when she was eleven, and she grew very close to her mother. She was an accomplished piano player but was too shy to play in public. By the age of 18 she began to write short stories that were later published. In 1912, Agatha met Archie Christie. They married on Christmas Eve 1914 after Archie returned from war in France, while Agatha worked with the Voluntary Aid Detachment in a Red Cross Hospital. Archie returned to France two days later, and they didn’t see each other often until Archie was posted to the War Office in London in 1918. In 1919, Agatha gave birth to her daughter, Rosalind, and John Lane of The Bodley Head accepted The Mysterious Affair at Styles for publication and contracted five additional books. 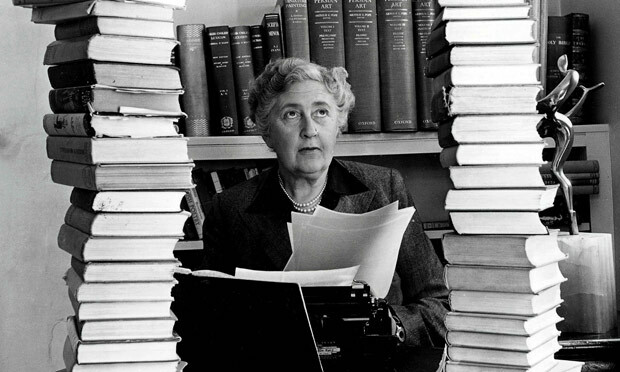 Following the war Agatha continued to write, creating Tommy and Tuppence and Miss Marple. In 1922, she and Archie travelled across the then British Empire, promoting The Empire Exhibition of 1924. She became the first British woman to surf standing up in Cape Town. She changed publishers to William Collins and Sons (HarperCollins). After returning to England, Archie and Agatha began to grow apart. Agatha’s mother died, and Archie fell in love with another woman. One night, Agatha disappeared. She left her daughter behind and told no one where she was going; her car was found abandoned the next morning several miles away. After a high profile search, hotel staff at the Harrogate Spa Hotel recognized her and notified the police. Agatha was suffering from amnesia and had no idea who she was. She and Archie never reunited. Agatha lived with Rosalind and her close friend and secretary Carlo following a course of psychiatric treatment in Harley Street. She was not officially divorced until 1928, when she and Rosalind left England for the Canary Islands where she continued to write. In 1929 she met her second husband, the archaeologist-in-training Max Mallowan. They married on September 11, 1930 on the Isle of Skye. They split their time between England and on digs. Agatha averaged about two to three books a year. During WW II, Max worked in Cairo while Agatha remained in England, writing volunteering at the Dispensary at University College Hospital in London. In 1943, Rosalind gave birth to Agatha’s grandson Mathew, who she spent much time visiting. She wrote as productively as ever, including her best selling novel, And Then There Were None. By the end of the war, Agatha became less prolific. She spent much of the 1940s and 50s working with theatrical productions, and died on January 12, 1976, after a very long and successful career, and many happy years. * She didn’t drink or smoke. * She is the only female dramatist ever to have had three plays running simultaneously in London’s West End. * Her first book waited five years before publication having been rejected by six publishers. * Hercule Poirot was given a full-page obituary in The New York Times. She ate cream out of the jar. When you’re Agatha Christie and you don’t drink or smoke, you choose your vices wisely.